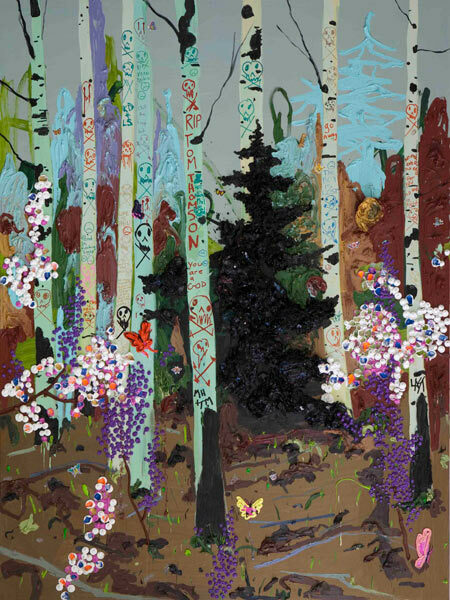 Still fresh, but just barely: earlier this summer Beautiful/Decay posted an interview with Toronto-based painter Kim Dorland (I think this is our first Canadian no-coaster?). Just want to throw it out there that I really like these. They could probably spark a similar discussion to Noderer’s but with a more candy palette. I especially like the residential neighborhoods–strange how something so familiar and banal as a semi parked in front of a house can be really evocative. I actually have a really hard time with Dorland’s paintings. It is something about the way color is used with the banal subject matter that bothers me. Also something about the degree of detail related to the overall grunginess (degree of detail and also type of detail; there’s rarely any degree of attention given to quirky or unexpected detail, it’s always on graffiti or leaves and flowers). I just watched a Ted.com talk by Olafur Eliasson, and one thing he says in it that gets me thinking, is that he’s making work that is not experienced statically, “like looking at a picture”. But the thing is for me, and I think for a lot of people reading this, that looking at great painting or photo is not a static event at all. I think that a lot of us engage with a Cranach or a Pollack in exactly the same way Eliasson hopes to engages us with his smoke and mirrors (literal, in this case). But with Dorland’s work, I still feel like I’m stuck at that static experience, looking at a picture. The grungy facture and banality of the imagery doesn’t bother me quite enough to get to that level of thinking about Dorland’s decisions, my relationship physically to the work, to the works’ challenge to artists with similar style or subject, with imagining narrative, etc. etc. I’m stuck. oh, and P.S. I’m not trying to take on Olafur Eliasson here, I’m really in love with his work. It’s just the one statement that makes me think. And even in the same talk, he says something about all art trying to do what he’s trying to do. So I think he personally gets it, he’s just aware that not everyone gets it. Dorland is a pretty fascinating cat. You may or may not like the work visually, but it’s certainly addressing a lot of issues and its hands down better than 90% of the paintings floating around these days. It’s also ridiculous to even begin to talk about the work unless you’ve seen it in person. The work is all about physicality and surface tension. It cannot be expereinced in any other way but in person. I think Eliasson wants to create an experience that can’t be separated from the experienc-er, something that the viewer becomes a part of and makes them more aware that they are connected to the environment they are in. If these paintings do that, I doubt it could come across effectively in a jpeg that gives little sense of scale, physicality of the surface, or how the painting is framed or sits on the wall. But as far as the images go, I do find them engaging and moody, not static. I do get Katz and Hopper from them, two artists Dorland mentions in the interview. Chris, to use your term from the conversation about Marcus Cain, do you think Dorland’s making too much of a product or is it something besides that? I did see the recent show at Freight + Volume, and there’s a Dorland painting at a local museum, the Nerman. I think the Lisa Sanditz next to the Dorland is all about physicality and surface tension, but I just don’t see it in the Dorland. And I’m going to go back to the idea of detail in these, it’s still just strikes me as pedestrian, unlike Doig or Katz who build up that tension in really unexpected surprising places. Another way to say it is that I don’t think the work is enough different in person from what I get from the jpeg. I’d love someone to clue me in to what I’m missing, but I admit I’m going to be picky about the answer esp. since it’s something I’m critical about in my own paintings. I don’t think it’s just the fact that the paint is thick. Joey, I don’t think it’s the same thing that I was thinking about re: Marcus Cain. I do see changes happening in the work, so I’m willing to believe that Dorland’s sincerely looking for a way to make richer and more inventive paintings all the time. I just know that I could dig the banality of these, or I could dig the surfaces, or the color. But I don’t, at least I don’t dig the way those things come together in the mix. I really hope I’m not being snarky or dismissive. I’m not meaning to be. I’m up for a good debate, because I know people like the guy’s work. I may of course be a pedestrian viewer (though I don’t see myself as such) , but I do think that Dorland’s surface tension manifests itself in surprising and unexpected places. There is a definite push/pull dynamic with the colors and textures; and the sheer material of the paint creates this ridiculous friction with the flatness of the paint around it. I will agree to disagree, but I don’t think that Dorland’s work is lacking any complexity or substance, its just a matter of what happens to click with the individual viewer. Allison Schulnik’s work addresses similar concerns, but it doesn’t absorb my interest as much as Dorland’s work. This is certainly not to say that Schulnik is lacking in any way, I just happen to be less engaged with the work. By the way, this is a great site and I appreciate the opportunity to exchange contradictory perspectives for the mutual benefit of expanding art consciousness. I also wanted to add…perhaps you shouldn’t look for Dorland’s work to address the same concerns that your own work does. After all that would limit your appreciation of a great number of painters with approaches different from your own. Painting is unique in that a fundamentally simple substance can take on such complex relationships when coupled with the technical and creative capacity of each artist. Cool. Though I think I’ve got a pretty decent track record of appreciating a wide variety of approaches around here. Oh most certainly… your track record is great! In fact, I hope that you continue to bring more attention to the diverse artists that you post about. You’ve certainly introduced me to a few. There’s nothing I love more than having a chance to joust a bit back and forth about art. Incidentally, I totally see where your concerns arise with regard to Dorland. He does prove one thing however, his art is at least interesting/challenging enough that it warrants discussion. Somebody jump in, from any angle on KD. I want the discussion to keep going, but I want to shut up for a while and watch. We’ve even got a new voice in the mix. Dennis (from http://www.paintersbread.com ?) seems ready to go. I wonder: if somebody told me that digging Dorland was a real regional thing I’d be really into that. Because, come to think of it, the Dorland fans I know all seem to be folks from North. Maybe a Ozarker like me can just never get it. Investigative Criticism…nothing wrong with that. It’s Declarative and Emphatic Criticism that I can’t stand. I’m actually Dennis Helsel, just an elementary art teacher and painter out in KC (I also have ties to UMC as I graduated there in 05—Ricky Allman is also currently my professor in the MA program over at UMKC). I’ve been reading your blog for quite a while, but I felt compelled to post on this particular thread because I just saw the Dorland show at Freight+Volune earlier this Summer. I’ve been taking another look at the Dorland work and I can see all of the things that you mention going on in the work The only difference is that all the things that you mention are actually part of what engages me about the work. The depth is certainly lacking, but It’s this closed in 2-level depth that causes me to investigate and linger on the surface so much. The work reminds me of some coloring page that has come to life almost like a claymation or some similarly rudimentary animation. Chris, I think you have a point about the textures and lack of attention on the negative areas. I would like to see KD challenge himself more with color, and maybe even more discordant colors. It seems to me that the example above is more like an illustration that’s trying to become a painting. Just a thought. I’m ok with KD’s work, but I think it could be taken further, to another level.